Strategic planning provides a holistic picture of how an institution is performing, what goals it wants to achieve and how it hopes to achieve the goals. It is a tool frequently used by management to re-examine its objectives, processes and achievements and collectively set new goals and targets, thereby repositioning the organization for greater effectiveness and efficiency. NIFAAS Strategic and Operational planning session was initiated through questionnaires being administered on stakeholders, followed with a validation session. 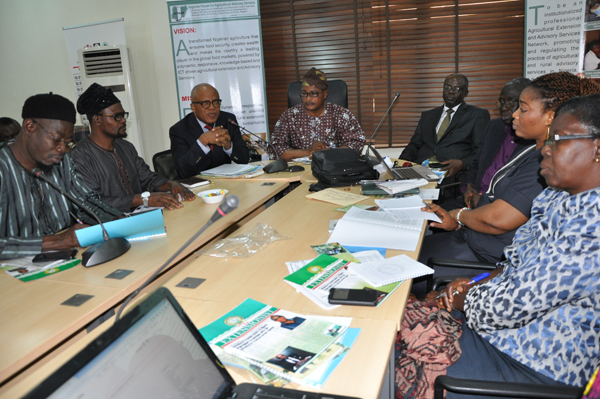 Two sets of questionnaire were developed, one for the steering committee members (to provide information on NIFAAS) and one for other stakeholders to provide information on the state of Agricultural Extension Advisory Service (AEAS) delivery in Nigeria and the preferred role of NIFAAS in AEAS reform. Effort was made to ensure the stakeholder questionnaire administration covered the entire agro- ecological zones to ensure opinions were considered from all the zones, while preference was given to individuals or institutions that are in the business of delivering Agricultural Extension and Advisory Services to farmers. The validation session was interactive and participatory in nature, conducted through a workshop setting with emphasis on practical and experiential learning. About forty-five participants were present for the exercise; facilitation was based on the premise that every participant has something to contribute, while effort was made to prevent dominance by a group or person. Syndicate group work was interspaced with plenary discussions to encourage participation. To ascertain the current position of NIFAAS, the Forum conducted SWOT analysis, PEST analysis, internal environment scan, Vision, Mission and Value exercises and several other analytical exercises. The results of these exercises were collated and prioritized by participants, and were further analyzed using the problem tree analysis approach, to identify the immediate and remote causes of each problem. These issues were classified as ‘crucial’ and ‘not crucial’ and were prioritized using a set of criteria jointly agreed on. These formed the basic material for the syndicate groups that developed the strategies and operational work plans. To institutionalize efforts for funds mobilization through internal and external means. To intensify efforts on advocacy for AEAS reform at international, national, regional and sub-regional levels. To strengthen efforts to identify, initiate and nurture collaboration with relevant stakeholders in agricultural extension and advisory services. The set of activities developed to achieve the strategies included objectives, key progress indicators, means of verification and other monitoring parameters. A sustainability plan, implementation and monitoring plan was also agreed on by the participants. Finally, a draft copy of the strategic session report was produced and sent to all stakeholders in an effort to allow for comments and suggestions on the document. By 2050, the world will have nine billion mouths to feed and Africa’s population would have grown from its current 1.1 billion to about 2 billion. Thus, meeting the growing demand for food will become increasingly challenging, as 80 percent of Africa’s farmers cultivate less than two hectares (five acres) per farmer. The vast majority of Africans still live in rural areas and are largely dependent on subsistence agriculture for their livelihoods. With a few exceptions, most economies in Africa are dependent on agriculture, but agricultural productivity is low and the absence of market, infrastructure and value chain addition inhibits growth and employment opportunities. Inadequate investment in agriculture, coupled with poor institutional capacity and ineffective farmer support systems, including agricultural extension and advisory services, have continued to hamper attempts to increase Africa’s agricultural productivity. The three principal means of increasing agricultural productivity is by farm area expansion, increase in input mix, and application of appropriate technology. With agriculture fast becoming a high technology venture, there is an increasing need to provide Nigerian farmers with appropriate farming technology for increased productivity through quality agricultural extension and advisory services. A quick trip down history would help put issues around Agricultural Extension and Advisory Services delivery in perspective. During the colonial times, it was the colonial government that designed extension services, called the Ministry of Agriculture Extension System. Expectedly, this was for the sole benefit of the British economy (Adekunle and Adewale, 1998). Later, the World Bank determined Agricultural Extension direction in Nigeria, leading to the adoption of the Training and Visit (T&V) extension delivery approach, through the Agricultural Development Project (ADP). The T&V system was an apt response to the weaknesses of its predecessor because it was structured on (i) professional focus on agricultural matters only (ii); time-bound, fixed schedule of visits by VEAS; (iii) concentration of efforts; (iv) regular and continuous training of agents, manageable agent/farmer ratio (v); and effective research extension linkage. However, it was alleged that the T&V system favoured the rich farmers who could afford the inputs that went with recommended practices (Jiggins et al., 1997). Also, the T&V system overlooked the complex management required in the risk-prone, mixed cropping system adopted by most resource-poor farmers. Unfortunately, at the end of the project, the World Bank withdrew from funding the programme. Consequently, it lost its vitality and is presently operating dismally as a government bureaucracy. In 1990, the Unified Agricultural Extension System (UAES) was introduced by the National Council on Agriculture. This system is a more holistic modification of the T&V system in that it provides for extension delivery in all sectors, such as crops, livestock, fisheries, agro-forestry soil and water conservation practices. It must be mentioned that Nigeria never had an extension policy that was promulgated by the legislature (or even a military government) assigning explicit mandate and providing a clear direction for the development and execution of extension programmes. As Osuntogun and Olufokunbi (1986) aptly put it “Extension activities came out of unstated and uncoordinated plans and multiplicity of related activities. Extension has not been treated on its own merit but as an appendage of agriculture. To develop a set of activities based on the strategies that constitute the operational plan to achieving its mandate.